"I have saved money and who doesn't like saving money!" SALISBURY, N.C.--(BUSINESS WIRE)--Today, Food Lion has a new way for its customers to significantly increase their savings through personalized offers on products and categories they already buy. 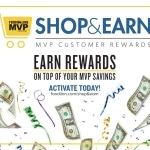 Through Shop & Earn, an enhancement to the company's current MVP Customer Rewards Program, shoppers can easily save more every month, in addition to their MVP savings and coupons. To celebrate the program's launch, Food Lion Feeds is partnering with Feeding America® to donate one meal* to local food banks for each Shop & Earn activation, up to 1 million meals*. Now available to customers across its 10-state footprint, shoppers can enroll online at www.foodlion.com or via the Food Lion Mobile App. "Shop & Earn is a unique loyalty program that puts our customers in charge of their savings," said Deborah Sabo, Senior Vice President of Marketing at Food Lion. "The more our customers shop, the more they will save. Offers are targeted to customers based on their specific purchases, fueling a program with nearly endless savings opportunities." 1. 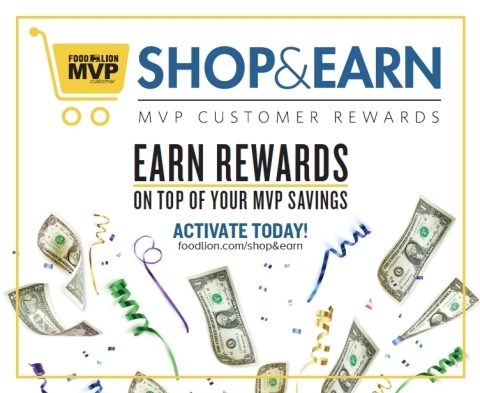 Activate: To activate personalized monthly offers to their MVP Card, customers should visit www.foodlion.com and access the Shop & Earn tab on the Savings Hub or via the Food Lion Mobile App. 2. Shop & Earn: Shop their offers with their MVP Card until they reach their goal. Progress can be tracked at www.foodlion.com/shop&earn or via the Food Lion Mobile App. Rewards are instantly loaded to their MVP Card. 3. Redeem: Rewards are automatically redeemed on their next shopping trip. "I like that Shop & Earn gives you the opportunity to earn additional discounts on everyday items." "[Shop & Earn] is a nice, extra incentive that makes Food Lion stand out from the other grocery stores." "I like being rewarded for being a loyal customer." In addition, new offers will be made available the first of each month. Customers can begin earning rewards once they visit the Shop & Earn landing page to activate and begin tracking and will have until the last day of the month to earn rewards. These rewards may be redeemed until the end of the following month. Shoppers can easily track their earnings progress on each offer online or via the new Food Lion Mobile App. In addition to viewing their personalized offers and rewards earnings, customers can save even more by also loading digital coupons to their MVP Card. For more information about Shop & Earn, visit www.foodlion.com/shop&earn. *$1 helps provide at least 10 meals secured by Feeding America® on behalf of local member food banks. $0.10 (monetary equivalent of 1 meal) from every customer that activates their Shop & Earn offers will be donated to Feeding America® and member food banks. Food Lion guarantees a minimum donation of $75,000 and a maximum donation of $100,000 from Feb. 1–28, 2018 through the activation of Shop & Earn offers. Meal claim valid as of 07/01/2017.